Before you cancel all of your plans in preparation for the inevitable news storm surrounding the Kimye wedding, take a moment to consider the likelihood of it actually happening. Not the wedding itself, of course, we all know those two egomaniac lovebirds are going to tie the knot, but the specific date. It's been reported that Kim Kardashian and Kanye West are getting married May 24 in Paris, and while the Paris part is definitely true, the May 24 part probably isn't. Kim has publicly stated that she and Kanye plan to wed in Paris because they both love it, they have an apartment there, he has an amazing song about it, etc. But in the same Jimmy Kimmel interview that she confirmed both the location and a summer wedding, when Kimmel jokes that she's not keeping the secret very well Kim responds, "I'm not telling you where or the date." Then there's also the fact that neither Kanye nor Kim, nor Kris Jenner, has confirmed the reported date. So, is the rumor true, based on wrong information or a date purposely leaked to throw off the press? Most likely, one of the last two. Here's why. Kim and Kanye are a power couple. They're constantly in the news and hounded by paparazzi. Kim might not mind the attention, but Kanye certainly does and to alert the world to their real wedding date would be a huge mistake. There are only so many places you can hold a wedding in Paris, and the couple has already been caught scoping one out. It wouldn't be hard for them to be discovered and forfeit all privacy or even worse, have E! lose the exclusive rights. Remember when Kim was married to Kris Humphries? Good times. Anyway, the Kim and Kris Aug. 20 wedding date was revealed in advance and since that whole thing kind of blew up in her face, I doubt she'd want any similarities between the two events, no matter how small. Plus, that wedding became a huge TV event and so far it seems like Kimye are planning on keeping things smaller. If it was good enough for the Hump, it isn't nearly good enough for Yeezy. Have you seen Kim's hair and makeup on an average day? She puts a ton of time into her appearance whether she's at home while filming Keeping Up With the Kardashians or making an official appearance, so just imagine what her wedding day beauty routine will entail. She definitely wouldn't want to risk any kind of rain and probably wouldn't want colder temperatures to put a damper on things either. And May does not guarantee good weather in Paris. Do you know how many regular people will end up getting married on May 24? A Saturday at the end of May, prime wedding time? 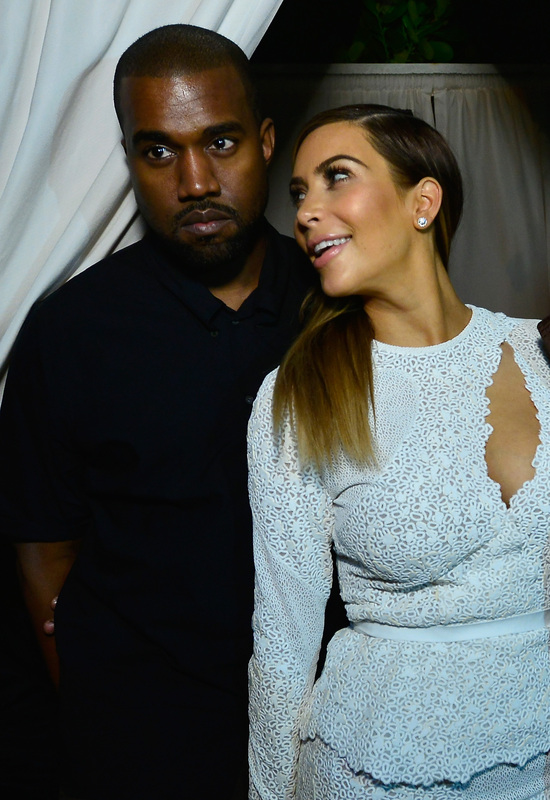 There's no way Kimye would be willing to share their anniversary with so many peasants. In fact, the whole summer is wedding season, so they either need to rethink the season entirely or find a very random date if they want their wedding day to be a little more exclusive. Kim has already said that they want a summer wedding and Kanye's birthday is June 8. He proposed to Kim on her birthday, so why not get married on his? No matter when they get married, the day will be half about Kanye, but if it's also his birthday? That swings the whole balance into his favor and essentially transforms it into a Kanye holiday. A Holiye, if you will (nailed it). How could he pass that up? As all good conspiracy theorists and teenaged boys know, Jay-Z, Kanye West, Lebron James and more of the celebrity elite are the new leaders of the Illuminati. Why else would they make triangles with their hands? Of course, the most important part of a secret society is the secrecy, so they all have to deny this. But May 24 would actually confirm their Illuminati status. After all, 11 is a big number for the society (as well as 3 and 13, according to YouTube researchers, so legit), and 5/24 breaks down to 5 + 2+ 4 which = 11. Uh oh. Jay and Bey would never let such an overt admittance of Illuminati-ness occur.